Deucoch Mirain finally decided to foal at 11 months and 25 days! 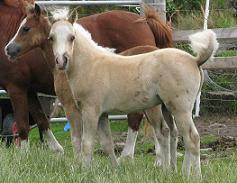 A lovely palomino colt foal, with a blaze and four whites. Pernod is a very striking colt, he is the last foal by the WPCS medal winner Nerwyn Gawain, who has been gelded to pursue a ridden career with his new owners. More photos to follow shortly.